A Very Long Life, AMGA Guide Bulletin, July 2018. Making Sunshine Tracks—Eklutna Trek is a Springtime Adventure, Coast, April 2016. Alaska's Nordic Highlight—Tour of Anchorage is the Shining Crown of Alaska Ski Races, Coast, Feb 2016. The Importance of Failure—The Art of Learning from our Follies, Off-Piste, March 2015. Perfecting the Pitch—Dry-Tool Bouldering an Autumn Precursor to Winter Fun, Coast, Nov 2015. Hero Skiing—Early Summer is a Great Time to Hit Backcountry Slopes, Coast, May 2015. Spring Sourjourn—Arctic to Indian Traverse a Sky-High Tradition, Coast, March 2015. Winging It—When a Spur-of-the-Moment Trip Turns Sour, a Dry Cabin Offers Reprieve, Coast, April 2015. Undaunted Discoveries—No Matter the Weather, the Persistent Alaska Adventure will Prevail, Coast, Nov 2014. Fast Forward—Take on Chunks of Terrain with this Adventurous Hiking Style, Coast, July 2014. Rock On—Adventure Climbing Thrives in Southcentral Alaska, Coast, Sept 2014. The Whale's Tail, Scree, December 2012. To Cairn or Not to Cairn, Scree, December 2011. Arctic to Indian: Anchorage's Favorite Ski Tour, Cross Country Skier, Jan/Feb 2011. In Patagonia—El Chalten is Patagonia's Emerging Running Base, Trail Runner, pages 18-22, May 2010. Mountains Plus Mystery Equals Good Adventure, Part I, Alaska Public Radio Network audio story, Sept 2010. Adventure Fuels Ski Tour Through Wrangell Mountains, Part II, Alaska Public Radio Network audio story, Sept 2010. Mount Chamberlin, AK, Powder.com, Oct 2009. Revelation in the Mountains,Alaska, Oct 2009. Matanuska Marijane, Alaska, pages 14-19, Dec/Jan 2008. Alaska Muslims, Alaska, Sept 2008. Running to Latitude, Trail Runner, June 2008. Anchorage Air Cargo, Alaska, June 2008. 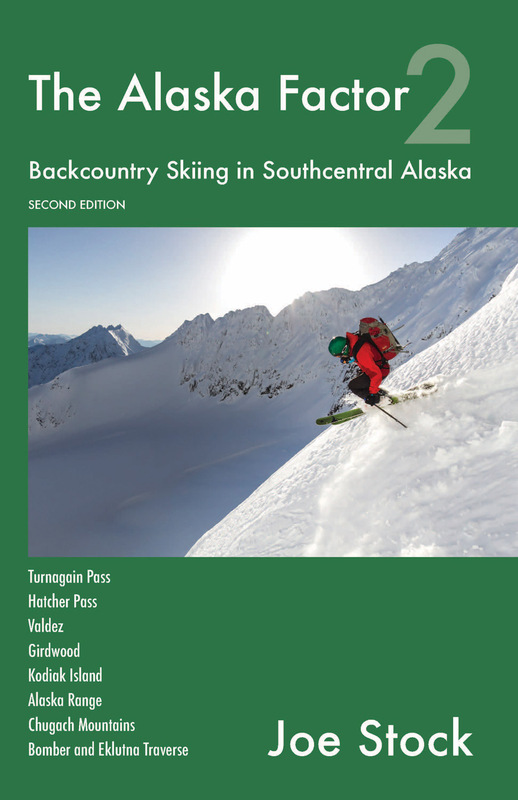 Backcountry Skiing book review, Backcountry, March 2008. Alaska Wines, Alaska, March 2008. Chugach Coolers—Chute Skiing in the Chugach Front, Off Piste, March 2008. Trek to Tolovana, Alaska, pages 52-55, 73, cover photo, Dec/Jan 2008. The Front Lines of Climate Change—Mountaineers are the World’s Witness to Glacial Decline, American Alpine Journal, pages 117-120, 2007. Feeling the Heat, Off Piste, pages 20-21, Mar 2007. A Mountaineer’s Perspective on Climate, Ground Zero, Special Report on Global Warming in Alaska, Alaska Center for the Environment, Center News, page 12, Winter 2006. Meltdown in the Nea-Coolers, The First Traverse of Alaska’s Neacola Mountains, Backcountry.com. Alaska Mountain Crusher—Running the Chugach Front’s Highest Peaks in a Day, Trail Runner, pages 16-18, Jan 2007. Searching for The Neacolas, Alaska, pages 32-38, Dec/Jan 2007. Alpine Climbing book review, Backcountry, page 52, Nov 2006. Joe Stock Gear Bio, Backcountry, page 42, Feb 2006. Brewed in the Backcountry—Two Beverages to Stoke your Fire, Backcountry, page 84, Nov 2005. Crushed by Consent—Alaska’s 175-mile Chugach Traverse Completed, Backcountry, pages 28-29, Nov 2005. Destination…Pipeline Bar—The First Anchorage to Valdez Traverse, Off Piste, pages 12-13, 18, Oct 2005. The Chugach Crawl. Alaska, pages 36-41, April 2005. Skiing the God of Thunder—100 Miles in Thor’s Chugach Range, Backcountry, pages 38-43, Feb 2005. Down the Gorge—Ski-Touring on the Ruth Glacier, Alaska. Backcountry, vol 36, pages 58-63, 2003. Baked Alaska—Turning up the Heat on the Juneau Icefields. Backcountry, vol 27, pages 56-59, 2001. Stairway to Heaven, Rock & Ice, vol 105, page 144, 2000. Avalanche Trigger: Artificial Elk, The Avalanche Review, 1(1): 4. 1997. Reprinted in: The Beacon, winter 1998. New Zealand’s Southern Alps: Alpine Climbing Down Under. Rock & Ice, vol 70, pages 38-41, 1995. Darrans Dan. New Zealand Alpine Club Journal, pages 26-28, 1995. Oh Aspiring! New Zealand Climber, Dec 1995. Balfour dreams. Written with J. Chapman, Rock & Ice, vol 65, pages 62-67, 1995. Learning from Mistakes—Train your Intuition to Make Good Decisions in Avalanche Terrain, Avalanche Review, Feb 2018. Your System—An Individualized Approach to Avoiding Avalanches, Avalanche Review, April 2016. Mind the Red Flags—Avoid Avalanches by Recognizing the Warning Signs, Coast, Jan 2016. Get the Gear—Backcountry Skiing Has No Shortage of Sweet Toys, Coast, Dec 2015. Backcountry Boom—Skiing the Urban Wilds Requires Some Ethics Know-How, Coast, Fed 2015. Lighten your Load, Spadout.com, Jan 2010. Communication Methods for Avalanche Terrain, AIARE Newsletter, pages 9-11, Summer 2010. Red Flags for Snow Stability, Turnagain Times, Dec 2009. Not-So-Fine Dining—Winter Camp Cooking, Spadout.com, Dec 2009. Inside the Ping Pong Ball—Tricks for Whiteout Navigation. Spadout.com, Dec 2009. Uphill Vegging—Conserving Energy While Setting Skin Tracks, Spadout.com, Dec 2009. Red Flags—Scoping Unstable Snowpack, Spadout.com, Nov 2009. Pure, White Snow, Spadout.com, Sept 2009. Ski Fitness Prep, Spadout.com, Sept 2009. Office Time before Play Time—Tour Planning. Spadout.com, Oct 2009. Decision Making Framework, Backcountry, page 50, March 2009. Shear Quality, Backcountry, page 47, Jan 2009. Six Flags, Backcountry, Jan 2008. Camp Cooking, Backcountry, Sept 2008. Getting to the Point—Sharp Skills for Crampons and Ice Axes, Backcountry, pages 32-33, Jan 2007. Air Taxis for Backcountry Skiing, Backcountry, Nov 2007. Minimal Impact Backcountry Skiing, Backcountry, Oct 2007. Getting Hitched—To the Munter, the Word’s Lightest Belay Device, Backcountry, pages 32-33, Feb 2006. Sharing the Load—What’s a Tent, a Stove and a Rope Among Friends? Backcountry, pages 36-37, Dec 2006. Winning the White Battle—Tricks for Whiteout Navigation, Backcountry, pages 34-35, Nov 2006. Scouting Session–Tour Planning Like a Pro, Backcountry, pages 30-31, Oct 2006. Tips of the Iceberg—Making Sense of Glacier Travel. Backcountry, vol 39, pages 28-29, 2004. Mountain Light–Minimizing Climber Impact on the Alpine, Climbing, vol 233, page 100, 2003. Grin and Bear It—Taking the Peril out of Whiteout Navigation. Climbing, vol 225, page 60. 2003. Glacier Travel. Rock & Ice, vol 106, page 48-50, 2000. Avoid the Big Ride, part II—Learn to Read Avalanche Slopes. Climbing, vol 197, page 162, 2000. Avoid the Big Ride—Learn to Read Avalanche Slopes. Climbing, vol 196, page 124, 2000. Avalanches and Climbing—The Human Factor, Rock & Ice, vol 82, pages 108-110. 1997. Avy Airbags—Better than Beacon, Shovel & Probe?, Spadout.com, Dec 2010. Are Backcountry Brakes & Leashes Necessary?, Spadout.com, Dec 2010. Cold Weather Hydrating, Spadout.com, Nov 2010. Survive This—Broken Ankle (Emergency Shelters), Spadout.com, Nov 2010. Avy Safety—Gear for Companion Rescue, Spadout.com, Oct 2010. Survive This—Wind Rips Your Tent, Spadout.com, Oct 2010. Bear Defense for Non-Gunslingers, Spadout.com, Sept 2010. Backcountry Food Storage in Bear Country, Spadout.com, Sept 2010. Do It Yourself—Expedition Sleds, Spadout.com, Aug 2010. Therapy for Unstable Stoves—Stove Boards, Spadout.com, Aug 2010. Mountain Pole Dancing—Trekking Poles, Spadout.com, July 2010. Slinging and Racking Pickets, Spadout.com, July 2010. Basic & Technical Ice Axe Ratings, Spadout.com, May 2010. Breaking Down the Glopping Frontier—Hot Waxing your Skins, Spadout.com, April 2010. The Right Points—Aluminum or Steel Crampons for Mountaineering, Spadout.com, March 2010. Keeping Your Climbing Rope Hydrophobic, Spadout.com, March 2010. Ballistic & Featherweight—Climbing Pack Fabric, Spadout.com, March 2010. The Ultimate Ski Repair Kit, Spadout.com, Feb 2010. Backcountry Coffee—The Ultimate Fix, Spadout.com, Jan 2010. Unorthodox Skins. Spadout.com, Nov 2009. Staying Safe with 3-Antenna Beacons. Spadout.com, Oct 2009. Little Cords for Big Anchors, Spadout.com, Sept 2009. Rappelling with Big Mountain Saddlebags, Spadout.com, July 2009. Strung Out—Ropes for Ski Mountaineering, Backcountry, pages 34-35, Feb 2007. V-Threader for Dirtbags, Rock & Ice, vol 132, page 78, April 2004. 100 miles in the Wrangell Mountains with Joe Stock, G3 House Blend, July 2010. Unabridged Adventure in the Wrangell Mountains, Osprey Blog, June 2010. Mount Chamberlin, Scree, Jan 2010. Tordrillo Mountains, first full-length traverse. American Alpine Journal, page 129, 2009. Mount Chamberlin--Skiing from the highest point in the Alaskan Arctic, Ospreypacks.com, 2009. Skiing the Brooks Range's Highest Peak, AAJ Inclined, Oct 2009. Mount Chamberlin Ski Descent, G3 House Blend, Oct 2009. Sunshine and Dirt at Alaska Ice Climbing Festival, RockandIce.com, 2009. Alpinists Complete 100-mile Mega Traverse, Climbing.com, 2008. Entire Tordrillo Range Traversed, Alpinist.com, June 2008. Mission Impossible: A full-length traverse of the Tordrillo Mountains, Alaska. BlackDiamond.com, 2008. Neacola Mountains, first full-length ski traverse. American Alpine Journal, page 173, 2007. The First Ski Traverse of the Neacola Mountains, Alaska. Ospreypacks.com, Nov 2006. The Chugach Crippler: Running the 12 highest summits in the Chugach Front in a day, Scree, Nov 2006. The First Ski Traverse of the Neacola Mountains, Scree, pages 3-4, Aug 2006. Ski Traverse of Neacola Range, Climbing.com, 2006. Chugach Mountains Ski Traverse, American Alpine Journal, page 197, 2005. The Chugach Crusher—Anchorage to Valdez, first ski traverse, Scree, pages 5-6, July 2005. Antisana Sur, Northwest Face, New Route. American Alpine Journal, page 269, 2001. Stock, J., K. Elder, and K. W. Birkeland. 1998. The temporal variations of near-surface faceted crystals, Red Mountain Pass Corridor, Colorado. Proceedings of the 1998 International Snow Science Workshop, pages 143-146. Stock, J., K. Elder, and K. W. Birkeland. 1998. Near-surface faceted crystals and their effect on snow stability, Red Mountain Pass Corridor, Colorado. Proceedings of the 66th Western Snow Conference, pages 143-146. Stock, J. and A.C. Pinchak. 1995. Diurnal discharge fluctuations and streambed ablation in a supraglacial stream on the Vaughan-Lewis and Gilkey Glaciers, Juneau Icefield, Alaska. Proceedings of the ASME Heat Transfer and Fluids Engineering Divisions, vol 321, pages 285-292. Marcus, A., S. Ladd, J. Stoughton and J. Stock. 1995. Pebble counts and the role of user-dependent bias in documenting sediment size distributions. Water Resources Research, vol 31, pages 2625-2631.